The discussion around my post on press release buzzwords has brought my attention to a variety of resources on language and writing, the latest being a new book called Wordcatcher. Long before getting involved in marketing communications I was a kid who grew up loving stories and more specifically words. The stories found in books, articles, songs, poems – you name it – have an amazing ability to conjure up entirely new worlds around us. And the primary vehicle of the storyteller is words. The right word in the right place is an incredibly powerful tool and some words just have a way of jumping off the page at us. In Wordcatcher author Phil Cousineau explores the derivation of 200 or so words that have jumped out at him over the years. A lifelong lover of words, Cousineau has spent decades collecting and exploring the ones that fascinate him. In the book he focuses on words with surprising derivations and those that are “fun to say…or mellifluous to hear.” Each word gets about a half-page entry digging into the history and usage of the term along with some companion words. Bamboozle, bandersnatch, false friend, frizzle, heckle and honeymoon – there are all kinds of interesting tidbits to learn. Kibosh is an old Gaelic word referring to the Irish funeral practice of putting a black cap on the deceased. So to “put the kibosh” on something is to declare it as good as dead. Nostalgia was coined in 1688 by an Austrian medical student who joined two Greek words to describe the longing for home of Swiss soldiers stationed in the mountains. Pun comes from the Anglo-Saxon “punion” meaning “to pound.” So a pun’s play on words is arrived at by beating them into new senses, as Walter William Skeat once said. I could share more of the “word stories” but I wouldn’t want to take away the fun of exploring them for yourself. It’s a great read and I enjoyed Cousineau’s introduction almost as much as the book itself because it paints a vivid picture of how he became fascinated with words. 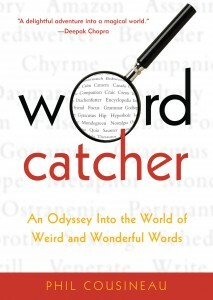 For those of us who spend all too much time muddling through marketing copy, Wordcatcher is a wonderful reminder of the magical qualities of words.